The Swiss Filmmakers Association ARF/FDS is relieved and more than happy about yesterday’s vote against the abolition of the national public broadcaster. 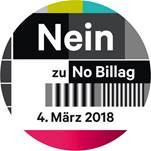 The Swiss citizens rejected the so-called „No-Billag-Initiative“ with a spectacular 71%. As it turned out, not one single Swiss county is ready to accept the idea of abolishing the national public broadcaster SRG SSR. The acceptance of the „No-Billag-Initiative“ would have had disastrous consequences for the very fundament of democratic participation, especially in our country where independent high quality information in all four languages is indispensable. The No-campaign was supported by many parties, trade unions and civil societies. It was more than 10’000 artists and people working in the cultural sector, though, that engaged themselves with all their heart and creativity in the campaign. The public broadcaster SRG SSR is essential for the cultural and especially the audiovisual sector in many different ways. ARF/FDS was thus an active player in the No-campaign from the very beginning. We do hope that the obvious message of yesterday’s vote in Switzerland will also help to prevent similar initiatives in other European countries. Please find hereafter the relating press release in German, French and Italian for further information.